The Highland Pony is one of the two native breeds of the Scottish Highlands and Islands. As a result, it has over many centuries adapted to the variable and often severe climatic and environmental conditions of Scotland. 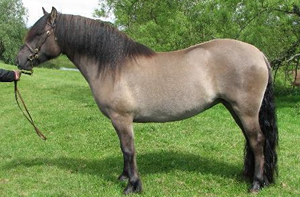 The winter coat consists of a layer of strong badger like hair over a soft dense undercoat, which enables this breed of pony to live out in all weathers. This coat is shed in the spring to reveal a smooth summer coat. This essential hardiness is combined with a kindly nature and an even temperament. HEIGHT: The height is 13 hh to 14.2 hh (132 – 148 cms). NECK & SHOULDER: Reasonable length of neck going from wither with a good sloping shoulder and well placed forearm. BODY: Well balanced and compact with deep chest with plenty of room for heart and lungs, ribs well sprung. LEGS: Flat hard bone; broad knees; short cannon bones, oblique pasterns and well shaped broad dark hoofs. Feather soft and silky. MANE & TAIL: Hair should be natural flowing and untrimmed with a full tail. COLOURS: A range of duns, mouse, yellow, grey, cream. Also grey, brown, black and occasionally bay and liver chestnut with silver mane and tail. Many ponies have a dorsal stripe and some show zebra markings on legs and shoulder. A small star is acceptable but other white markings are discouraged. Foal coat often changes and many ponies change colour gradually as they grow older, especially those with grey hairs interspersed with the original colour. Others show a slight seasonal change in colour between winter and summer coats. Broken colours are not allowed. CAPABILITIES: A ride, drive and pack pony and can adapt to many equestrian disciplines. There should be no pulling or plaiting or trimming of mane and tail, nor the feather on the legs. Eye or other cosmetic make-up must not be applied under any circumstances. The Pony should be shampooed, or thoroughly groomed to look and feel absolutely clean. Mane and tail brushed out well with a soft brush. Excessive hair under chin etc., can be discreetly laid with a damp brush before going into the ring. Hoofs should only be oiled. For the pony’s welfare, ridden ponies for winter competitions or hunting may be clipped out, always giving due regard to the above preparation rules. Legs should not be clipped in these cases. It should also be accepted that these clipped ponies may be placed somewhat lower if shown In-Hand in early spring show classes, depending on the In Hand Judge’s views. Martingales are permitted for WHP Classes only. No spurs to be used under any circumstances. Please note: NO white markings of any description, with the exception of a small white star, are acceptable in the showring. 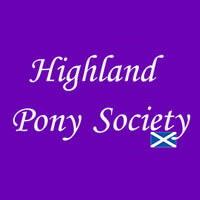 The Highland Pony Society actively discourages white markings of any description including white legs or hoofs. Female – well cut skirt (tartan or otherwise) or trousers. Showing cane. Male – Trousers or kilt with jacket, shirt and tie. Showing cane. Riding clothes with hard hat also smart, particularly on children. Stallion. Strong stallion bridle with white lead rope, chain or leather coupling under chin. Straight bar or snaffle bit or other suitable control bit. Roller with one side rein, usually on off-side correctly fitted. Mares and stock over three years. Show bridle with brass buckles or good quality brass-mounted headcollar with snaffle bit attached by bit straps. White webbing or cotton lead rope. White cotton or webbing halters may also be used. Youngstock. Show bridle with light straight bar bit (nylon or vulcanite mouth piece) or white cotton or webbing halter. Foals. Leather foal slip with white webbing lead rope or extra long halter. Breeches and boots or jodphurs and jodphur boots. Tweed jackets with shirt and tie. Tweed jackets are preferable to black/navy. Current standard hats to be worn when mounted. Gloves and cane/whip (NB: Certain ridden classes have rules on canes and whips). Immaculate tack. Double bridle, pelham or suitable snaffle bridle on younger/novice ponies. Well fitting saddle, no martingale.